This 4 days mountain bike trip takes you through beautiful countryside and intriguing villages. You will have the opportunity to observe the local minority communities at work, tending their fields in the shadow of the Chay river massif. The overnight stays in Bac Ha will give you the chance to explore the villages and visit the local market. From Bac Ha you can also visit the Can Cau market, crossing the Chay River by boat to the Bao Nhai village, where a variety of local minority groups can be found. Arrival at Lao Cai around 5:30 in the early morning, you are welcomed by your local guide and driver, have breakfast at the local restaurant then travel by car uphill to Mong Sen village where you start to trek uphill through a mountainous area by following a dirt trail. En route, you will have many opportunities to enjoy spectacular view over rice terraces and corn fields. Your trek continue by going downhill to Ta Seng and Ta Phin villages where you can meet Red Dzao and Black Hmong tribes, two largest tribal groups in Sapa. Here you stop to take a rest and have your lunch at the local home stay. The following is that you are transferred back to Sapa by car. Tonight you stay overnight at the hotel in Sapa. 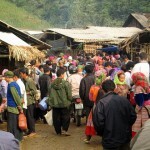 You will have the opportunity to visit the Bac Ha market. The huge market is always a riot of color with its collection of ethnic peoples. Flower Hmong, Phu La, Dao Tuyen are just a few of the tribes present. All gathered here to buy and sell their products. We start out from Bac Ha by cycling downhill to Bao Nhai, where we get on a boat to have a cruise on the Chay river. It is a perfect way to finish our trip by sitting in the boat exploring the life at the riverbank. Your jeep will wait for you in Bao Nhai and take to Lao Cai Railways Station to reach the train back to Hanoi..